Lurking Rhythmically: Gotham Rain: Chapter 2 - Ponies. Pistols. Prepping. 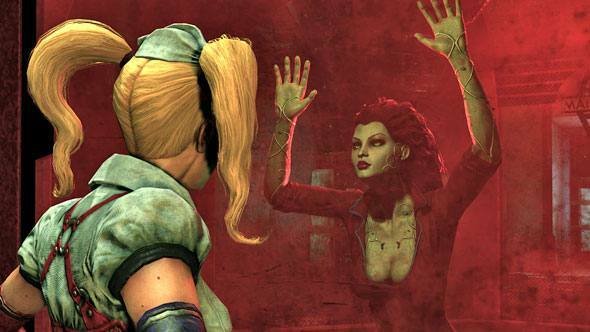 Harley Quinn sits alone in a cell in the Extreme Incarceration wing of Arkham Asylum, sobbing quietly to herself, as she has for the past several hours. Yep, that's me. You're probably wondering how I got here. Well, there's a good story behind it. I had the perfect plan: Draw the Bat into the nuttiest part of the nut hatch and wear him down with the adorably violent uncontrollable psychopaths before treating him to a nice dose of the electric floor. 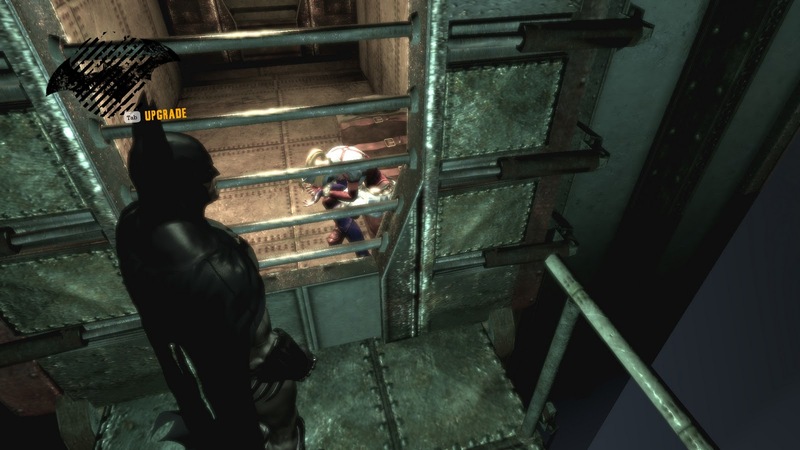 Quite rudely, he managed to make it through all the thugs I had with me without so much of a singe on his bat-patootie. Banged my head against a railing while he was at it, and tricked me into telling him where Mister J was, too. And... and, uh. Mister J... well, he wasn't too happy I let him down. I'm off the guest list. It's okay, though. I know he still cares. There's a bruise on Harley's head and her wrist is strained from when Batman captured her and stuck her in the cell, but she's otherwise in one piece. With the Asylum under Joker's control, no one's been in Extreme Incarceration since the Bat left her in the cell. No one awake, at any point. She's pretty sure at least one of those guys that got stuck on the electric floor when she turned off the safeties is dead. She's not sure whether she's more upset that one of her mooks hasn't woken up or at how the Bat was so dismissive of her. Contrary to appearance, Harley is a very smart woman, smart enough to have earned a doctorate and an internship at Arkham Asylum. It's where she met him, where she found the new direction of her life, and what she thinks is true love. And it infuriates her to no end that even despite having met him then, lab coat and glasses and all, the Bat still underestimates her. Here, though, Harley sees no way out. Extreme Incarceration is where they put people they really don't want getting out. There have been noises since she was locked up. A few pretty significant explosions, and she's heard something rumbling in the walls. Something's going on outside, and she can only hope that means Joker's taken out the Bat. This is different, though; Harley's head perks up as she hears a door hiss open and a wet thump as something hits the floor. She presses her face to the bars of the cell and catches a glimpse of red and green near the doors. "Ivy? Ivy, is that you? Wow, babe, you don't look so good," Harley calls out, straining between the bars to get a better look. Ivy's voice is weak, raspy, the sound you make when you rub two dry pieces of wood together when she responds, "Quinn. Hold still. We have to get out of here. Batman's taken down the Joker and the police are swarming the island." She strains visibly, making it to her knees. She grasps one of the bars of the cell, and vines protrude from her arm, wrapping around the gap where the bars meet. Tiny strands of plant material force their way into the gap, and the bars slowly open, the hydraulics whining against the strain. Harley slips through the tiny gap Ivy created, and Ivy collapses in exhaustion. "Pammy, baby, what'd he do to you? That awful Bat. He banged me up pretty bad, too," Harley says, as she catches Ivy before she hits the floor. She slips under one of Ivy's arms and lifts her, and the two begin to stagger towards the exit. "Not... not Batman. Joker... Joker pumped me full of that Titan trash. I don't feel so good, Harl..." Ivy manages before passing out. Harley clutches the vines on her arms and lifts her over her shoulder, feeling a swell of conflict passing through her. Mister J wouldn't hurt Ivy, she thinks to herself. Ivy's been one of the only people that's been nice to her, nicer even than... her mind won't let her finish that thought. He wouldn't hurt Ivy, and he only hurt me because I let him down. I didn't finish off the Bat, so I had it coming. She'll make it right, though. She has to. She'll make it right and he'll take her back and everything will be fine. She's just gotta get out of the Asylum first and back to the City. Then back to Mister J, so I can make this right.